Using ConvertKit + Thinkific to manage your courses. NEW: We have released a new feature called Purchases! Your Thinkific account will now send Purchase and Revenue Data to ConvertKit (without changing the connection process). Thinkific is a course management system that allows you to create and deliver courses online. We have a direct integration with Thinkific that is managed inside your Thinkific account (not your ConvertKit account). Get your API key from your Account page and paste it here. Click 'Save.' A little "Edit your Configuration" button will appear. Click this to manage your ConvertKit and Thinkific Settings. NOTE: you can access this page by adding "/manage/convertkit_configuration/edit" to the end of your thinkific course domain. If you want to Tag a student once they've completed a purchase of your course, select "Orders." Select the Tag you want to denote your Course Customers, (this Tag should be created in your ConvertKit account first), and click "Save." NOTE: An Order will only be generated for a Paid Course. If you'd like to Tag Students of a Free Course, you'll need to select "Full Enrollments" instead. 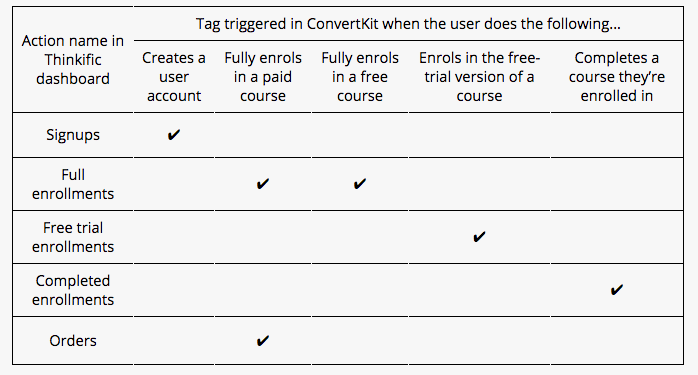 In ConvertKit, this Tag will help you keep track of how many Subscribers have purchased your course, so you could create a Segment of your Customers, exclude the Customers from a pitch Sequence, or even trigger a Sequence to drip with your Thinkific course. This could be used to remind them to check it, or to provide additional help and assignments. If you want to Tag a student once they have completed the course, select "Completed Enrollments." Select the Tag you want to use to denote your students that have finished, and click "Save." In ConvertKit, this Tag will help you keep track of how many Subscribers have actually completed every module and lesson in your Course. You could send them a special celebration message, or upsell them to another course.